Hello everyone! Long time no post--I've been working mornings and nights with no time to take photos, and then over the weekend I was visiting my sister who recently moved a few hours away. I have been trying out a lot of new products this month so I can't wait to tell you about them. I've bought a LOT of new eyeshadow palettes lately, and the one that stood out to me the most is this Harry Potter-inspired one. It has some beautiful, unique shades and it has been very fun to play with. The formula isn't the absolute best that I've tried, but it's still high quality and not at all difficult to use. Plus, this packaging is stunning! I'm preparing to do a mascara dupe post including this and two other affordable mascaras, so I've been testing them all and this one has stood out to me the most so far! I usually go for lengthening mascaras over volumizing or thickening ones, but Lash Princess is a volumizing one I can get on board with. This is one of the softest bronzers I have ever tried. JAMBeauty89 recommended it in one of her videos and during my last Ulta trip I swatched it in store and fell in love. It blends even better than my higher-end Benefit and Too Faced bronzers, like a matte version of my NARS Laguna! I'm obsessed with it and I'm worried that the pretty emboss is going to fade soon. I have dozens of hand/body lotions, but I adore the scent of this and want to smell like it every day. The packaging is cute, especially for the price, and I think you get a good amount of it, too. I'm so glad Zoella beauty has come to Ulta and I can't wait to try more of Zoe's products, especially in this vanilla macaroon scent. Every time a new season is released, I sit down and binge-watch it. Even knowing that I won't get any new episodes for an entire year, I can't stand getting spoiled so I have to watch it immediately. This one wasn't my absolute favorite for this show, but as always I think it tackles some big issues in a unique, funny way. Bill Bill Bill Bill Bill Bill! Bill Nye was a childhood favorite of mine and many others (apologies if you have no idea what I'm talking about) and now he has an adult show on Netflix. It's still science-oriented, but includes episodes about somewhat controversial issues such as global warming and gender identity. I went into this book not knowing much about it or the author and thought it was really funny. It follows a character named Simon who is a powerful, Chosen-one orphan wizard and attends a magical boarding school. Sound familiar? The idea behind it is very meta because apparently the Simon Snow series is the book-within-a-book focus of Rowell's more popular novel Fangirl. It does have a definite Harry Potter vibe but with enough differences that it was a fun read with a few unexpected twists. For donations this month I continued to contribute to a film that is being made by my favorite actress, called BEND, and donate to Planned Parenthood, which goes for things like cancer screenings and women's healthcare. I would love to hear about what you've been loving this month! 16 comments on "June Favorites"
I agree. OITNB could've been a bit better, but it was still good. That Storybook Harry Potter palette is gorgeous! 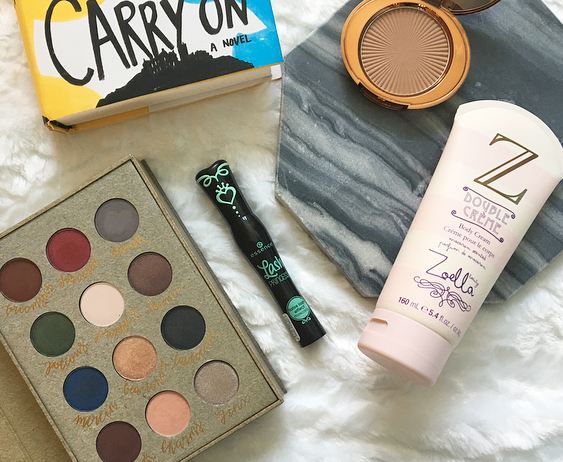 That bronzer looks amazing for summer! I'll definitely have to keep my eye out for it. With summer here I'm always looking for the next best bronzer! I have that Essence mascara but I don't like it much, I have the Essence Lash Princess Volume Mascara and it's my holy grail, but that one in the green and black tube I don't like. They eyeshadow palette is so pretty! I love the Zoella body cream, it smells amazing! I really want to try some of the Zoella Beauty range, every thing sound so nice. Me and my brother have just started watching Person of Interest and I'm really enjoying it. The Harry Potter palette looks so cool! I'm not surprised that palette has made your favourites, it's so unique and pretty!